The Good The Bad And The Ugly - LFChistory - Stats galore for Liverpool FC! Robbie Ashcroft (aka Mottman) relives the path to European cup glory in 1977. This article was previously published on the forum of redandwhitekop. JOEY ATE THE FROGS LEGS - MADE THE SWISS ROLL - NOW HE'S MUNCHIN' GLADBACHS. After successfully winning the league title culminating in a 3-1 away win at Wolves, watched by perhaps the largest league away following EVER! Liverpool where entered into the European Cup. Our first round opponents were the Belfast part-time team Crusaders, the first leg was to be played at Anfield with the return leg away in Belfast two weeks later. Date 14th September 1976 – European Cup 1st Round First leg held at Anfield. In the build up to the inaugural game, it was suggested by the media that Liverpool would create yet another scoring record and that Norris McQuirter would soon be legging it back to Roy Castle with another record breaker. Obviously Bob Paisley and the rest of the backroom staff knew this might not be the case, and such talk was soon rubbished as everyone knew that what Crusaders lacked in skill, they would more than compensate for this with a super human determination to succeed as a team. The newspapers adopted Billy Johnston Crusaders' manager, as a sort of icon representing the underdog in this David versus Goliath encounter. He proudly boasted that his team would come to Anfield and defend for all there worth, he pinned his hopes on a tried and tested game plan which was introduced to stifle the Liverpool forwards. The talk of record making had quite clearly hurt those involved with Crusaders, a low scoring defeat would in itself be a moral victory and dispel any need for the Guinness book of records. Containment was the key to any possible success. On a cold, damp September evening walking up to Anfield the air was full of expectancy as we thought another goal scoring feast was in store, surely all this talk about containment and defending was just paper talk? Once in the Spion Kop it was noticeable that this was not going to be a sell-out, the Annie road, Kemlyn and Main stands where very sparsely populated whilst the Kop was three quarters full. 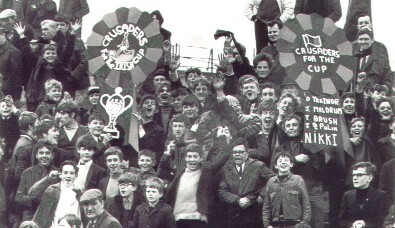 The "restricted" seats Kop end of the Main stand housed around 20-30 Crusaders supporters, the "banter" soon flowed as the Liverpudlians welcomed their counterparts from Belfast. On the pitch the Crusaders played to the expectations of Billy Johnston, as they "to their credit" silenced the home crowd and frustrated Liverpool’s flowing style of football. Very early on in the game we had a shot against the crossbar, this was to prove typical of the football we played that night. After 20 – 25 minutes Liverpool where awarded a dubious penalty, after a foul on John Toshack, the spot kick was safely put away by Mr Reliable himself Phil Neal. As the mist rose from the Spion Kop we celebrated in the way that only the Spion Kop could, whilst the Crusaders supporters continued to sing their heads off in the Main Stand. This is probably one of the most one-sided games of football I have ever witnessed at Anfield, as we watched a full 90 minutes of wave after wave of Liverpool attacks which saw John Toshack head in the only other goal of the night after an hour or so. At the end of the game the Crusaders team walked up to the Kop and received an ovation to acknowledge their efforts and commitment. To their credit, Crusaders visited Anfield with the sole intention of not replacing Stromsgodset in the record books and to gain a respectable score line. They did succeed in this without having a single shot at goal or gaining a single corner kick. The only time they came out of their own half was to change ends at half time. Walking out of the Kop that night, we clapped the now standing Crusaders supporters stood directly above us in the Main stand, you have to give credit were its due. As you may imagine, the national press took great satisfaction in ridiculing Liverpool’s performance the days that followed. On the bus home a couple of the lads complained about the score line "That was shite, fancy only beating a load of part time no-marks two nil"…"We won didn’t we, what’s your problem?" I replied. A heated discussion then took place as questions where asked about individuals loyalty to the redmen. The next week whilst with a few of the lads, Ian suggested going over to Belfast for the return game. We all sat in stony silence as we each considered what to do, I had not even contemplated going over to Belfast this in my eyes would be a one-off opportunity. No one said anything this was to be expected? Ian would go anywhere to follow the reds and he was always the one who would go with me, when no-one else felt like going. Out of loyalty or just because none of the others would go I felt obliged to go with him after all he never ever let me down. I said "lets price it out first, then lets see how much it costs", Ian said he would ring around in the morning and find out the cheapest price. I half-heartedly agreed and to be honest never gave it another thought until Ian raised it again one dinnertime at work. The best price was just about within our means, but my real concern was what would it be like over there. Obviously we were aware of the "troubles" over in Ireland, as we had all watched over the years, the nightly coverage on the television news. I sought advice from my parents, both of whom agreed "If you want to go over and watch the match, you go over". Ian finally convinced me that it was worth a visit, as he had family over there and that things weren’t as bad as what was portrayed on the telly. We sat down and discussed the best options available to us, we soon agreed that our trip would be via plane to Belfast Airport arriving on the Monday afternoon and leaving for home later on the Wednesday evening. We booked our plane tickets and shot off up to Anfield to buy match tickets. As per usual, the ticket office didn’t want to sell us any they only wanted to sell tickets to people who had made arrangements to travel via the official Liverpool FC organised tour. We explained that we were members of the "official" Anfield Special Club and that we had travelled many many times with them. We asked could we see the manager and after much ado we produced our ASC membership cards and she finally authorised our tickets, plus one spare one for Alex. The annoying thing was we knew her face and you could tell she recognised us, officialdom gone mad? Anyway tickets sorted, now to sort accommodation. Ian rang his uncle over in Belfast and explained we were coming over for the match and wanted somewhere cheap to stay. The next day a call was received offering us a family run hotel, this was of course acceptable Ian’s uncle paid the deposit for us and posted the details over to us. As the days moved nearer we sorted all our things out and soon had everything boxed off apart from the airline tickets, after a couple of telephone calls we were promised that they would be posted by the Wednesday. On the Thursday they duly arrived at Ian’s address only with Manchester Airport as the departure point. We had specifically requested a departure from Liverpool Airport and these dimwits had messed it up. More telephone calls were made and we eventually managed to get them swapped for Speke, we did ask but never received any confirmation that our flights would be from Liverpool.